Is Google Street View Photojournalism? Site © World Press Photo. Images © by whom? This year in the World Press Photo Awards an honorable mention was awarded to Michael Wolf, a prior World Press award-winner from Germany. Wolf’s entry this year was for a series of photographs made of the screen of his computer as he explored Google’s Street View, a service in which automated cameras mounted on vehicles trawl the world to present the street in virtual space. The debate over the award (as is often the case with World Press Photo) is interesting to read. The criticisms ring with complaints that they are not his pictures, that it wasn’t him standing there slicing those moments from time, that he’s not out in the world struggling with the rest of us. These criticisms are a bit navel-gazing in that they are mostly about how we define ourselves as photojournalists, not in how we define what photojournalism does. The boys at dvafoto have an excellent post on these points. You can see Wolf’s comments and thinking in an interview in the British Journal of Photography. Photojournalism (and photography in general) has a long history of overvaluing process when the only thing that matters is the result. What really matters to the reader? The process or the picture? The complaints smell a bit of “you took the easy way out.” That’s not a legitimate argument. Wolf’s collection of images is fascinating, powerful, opinionated, curious and somewhat addictive. I like them very much. They are art as Girl Talk’s remixes or John Cage’s Chance Music are art. But they are not photojournalism. By presenting this work with a venerable photojournalism award, the World Press Photo jurors have declared them photojournalism, even when Wolf himself apparently does not. My argument against these images as photojournalism is over the lack of context. As photojournalists we all know how critical it is not only to understand how an image we make or publish would be read, but also what the circumstances are surrounding those images so we can correctly inform the reader. We’ve all made photos sliced out of air that without context might mean something entirely different than the story we were there to tell. In our outtakes we all have images that might accidentally lie, and as photojournalists we have the responsibility to make sure those don’t see the light of day as journalism. What is happening in these images? We can assume, but we cannot know. Wolf can assume, but he cannot know. He was not there to see the moment unfold and interpret its meaning. He could not follow up with the subjects to clarify what just happened. Wolf uses the term “curate” to describe these images, and I think that is closer, but still not correct. He is collecting things out of context and interpreting them from personal experience, but not the background information. A curator has context and background from the maker of the images. Wolf lacks even that. An editor of photojournalism should also gather the background and context from the photographer/witness before publishing. Wolf can’t (realistically) do that either. Our job is an imperfect one. We inevitably contextualize important events through the filters of our own eyes, our own lives and our own experiences. But we should do the same through the objective circumstances of the scene. It is the valiant effort to understand the scenes we photograph that makes us journalists. It is not the process we use to capture the images. World Press Photo’s jurors surely knew this would be a controversial award. I find nothing wrong with Wolf’s work other than the label put on it by the jurors of the contest and by Wolf in entering it there. There are many appropriate venues and labels for “A Series of Unfortunate Events,” but Press Photo is not one. I was unhappy to see today that Britain’s venerable Economist joined the ranks of other foolish magazines that unacceptably alter cover images. Its June 19 cover features an image of Barack Obama in front of an offshore oil rig, looking as upset as Obama seems capable of looking. 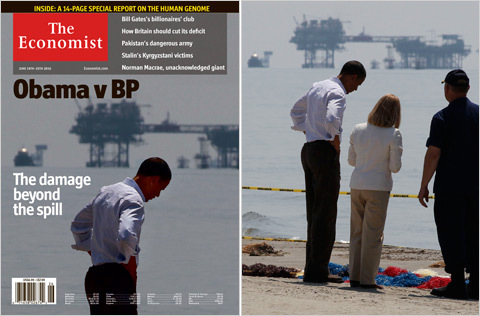 It’s a strong metaphor that fits their “Obama v BP” headline. The problem is that there were two other people in the original Reuters image. And in seeing the whole frame Obama is not looking down in dismay. He’s gazing at cleanup materials at his feet or bending an ear to parish president Charlotte Randolph. The context for the downward gaze was entirely removed. “I was editing the paper the week we ran the image of President Obama with the oil rig in the background. Yes, Charlotte Randolph was edited out of the image (Admiral Allen was removed by the crop). We removed her not to make a political point, but because the presence of an unknown woman would have been puzzling to readers. “We often edit the photos we use on our covers, for one of two reasons. Sometimes — as with a cover we ran on March 27 on U.S. health care, with Mr. Obama with a bandage round his head — it’s an obvious joke. Sometimes — as with an image of President Chavez on May 15 on which we darkened the background, or with our “It’s time” cover endorsing Mr. Obama, from which the background was removed altogether — it is to bring out the central character. We don’t edit photos in order to mislead. If I could bring her into my classes and ask her to comment on the alteration decision, I doubt she would survive long under questioning from students. I, like most of my colleagues, hope to train students beyond the simplistic “you just don’t do that” argument. Critical thinking is a key to good journalistic judgment, and rarely does the easy answer hold up. Let’s look critically at Duncan’s reasoning. First, intent is not evident to a reader. Her lack of intent to make a political point is irrelevant. You lose any argument that a decision is apolitical as soon as an alteration is made, because why else would you alter history? Second, a puzzled reader is a simple thing to overcome. As Wilson Hicks, the venerable editor of Life Magazine noted, it is the combination of words and pictures that most effectively communicates. Few if any journalism pictures can stand alone without a caption. More puzzling than a mysterious extra person is the choice to put a deceptive picture on the cover of one of journalism’s most esteemed publications. Why would she want to erode reader trust by changing what was before the camera? “Obvious” is the key there. Digital alterations of news images is a hot-button issue because as journalists we seek to not deceive readers. I frankly have no trouble with heavy-handed art made from news images in news publications as long as it is patently obvious to the average reader that the image has been rethought, combined with others or torqued beyond question. I have not seen that March 27 cover, but I would guess it is pretty clearly a digital mashup. But this June 19 case is certainly not so. They made this woman disappear in a way that Stalin would envy. How many of you image-savvy professionals out there would have spotted this as an alteration? 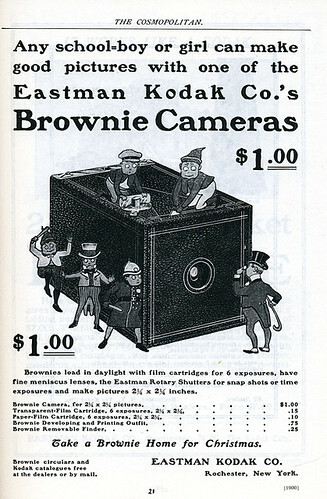 Would you flip several pages deep to hunt for the six-point credit that reads, “Photo Illustration by…”? And if the average person did, would s/he think that the term “photo illustration” was anything more that a couple redundant words before someone’s name? (Having not seen the magazine yet I have no idea if they credited the image in this cryptic way). It’s OK to be plainly, playfully obvious I think. But this was certainly not a transparent change. I think they did intend to bring out the central character here, and I can sympathize with that hope. I am sure their ideal cover involves a clear, simple graphic statement that acts as a metaphor or confirmation of lead story. Having seen neither the Chavez nor Obama Health Care covers, I can’t judge whether they were obvious enough for me. But removal of anything from an image is misleading and can be even if the image is only cropped. There was context behind both those heads, and perhaps even context cropped by the photographer as s/he shot the images. Cut-out images need to be as transparent as any other. Even if those two other examples were as clear as I’d hope, this June 19 image is not. How many images have been made of Obama? Of the Gulf oil spill? Of Obama at the Gulf oil spill? Is this really the only image out there that makes this point? Isn’t a better answer — one that would maintain the critical trust of the readers — to find a different image? If all that is impossible and you feel the only image available would not work without being altered, then why not go all out? Why cop out with the simple removal of a person who was there giving context to that image when you could find a perfect Obama, a perfect flaming oil rig and make something infinitely more artful and obvious? Caricature-like montage illustrations are a cop-out in my book too, but if there’s any place they work it might be magazine covers or opinion pages, so it’s a reasonable choice here — certainly better than this deceptive alteration. This is an excellent example of why we should not alter journalistic images. Intent to deceive or not, the entire story has changed from the original to the final alteration. Then why is this the one and only image that could be used? Why was this frame so important that it needed to be deceptively altered? For me the resulting image says only that Obama is disgusted with the spill somehow. And that isn’t the true message of the original frame. The original Reuters picture says Obama discusses cleanup efforts with local and national officials. So this altered image lies. And if the story is about the damage to business in America, then this image is a total failure. No hint of that message is there. Like every similar case I see, the excuses are simply excuses. When a publication decides to make an alteration to a news or documentary image it all comes down to laziness. They didn’t take the research time, the creative effort or the thought to find the honest solution. And the resulting justifications (of which there are hundreds) are simply poor justifications.